It also supports two hooks which can be used if you want to be notified when states are changed. It's implemented with a fluent interface to allow for method-chaining. toggle returns the new state after it's been toggled. 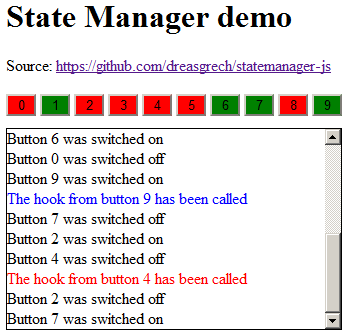 Note that the onStateChanged event fires only when a state changes. For example, if you turnOn("state 2") while "state 2" is already on, the event will not fire. The same goes for when a state is off and you try to turnOff.